5S is a workplace organisation method that describes how best to organise your work space for optimal efficiency and effectiveness. The original 5 S’s come from Japanese seiri, seiton, seiso, seiketsu, and shitsuke which can be roughly translated to Sort, Set In Order, Shine, Standardise and Sustain. Remove any unnecessary items that are not used or not cost effective from the work area. Employ a supervisor to check the area on a regular basis. Organise components per their use so they can be easily obtained, with the frequently used components being nearest to the work place. Reduce waste by making sure the components needed are near work station that requires them. Implement a first-in-first-out system. Clean the work area, equipment and tools on a daily basis to prevent equipment deterioration and cross contamination. Standardise the practices in the work area. Everything must have a place to be returned to once finished with and all processes must follow the set standards. Analyse and review the 5S system in the workplace and focus on training staff to understand the processes and importance of 5S. This is to maintain the system and keep the workflow running smoothly. Six Sigma is a philosophy that simply means a measure of quality that strives for near perfection. Six Sigma is a disciplined, data-driven approach and methodology for eliminating defects in any manufacturing process. Six Sigma has become an element of many Total Quality Management (TQM) initiatives.The statistical representation of Six Sigma describes quantitatively how a process is performing. TwinBin adheres to Six Sigma philosophy in enabling manufacturing companies much tighter controls of stock and inventory with full statistical back up. The system provides inventory control, 100% traceability levels for even the smallest of components, less waste, no possibility of environmental contamination and stock cross-contamination. FIFO is an acronym for First In First Out. It is used to describe the processes units are consumed in the order in which they were delivered. For example an order of 4mm screws that came in on May 1st 2016 should be consumed completely before use of the order of 4mm screws that came in Decemeber 1st 2016. JIT stands for Just In Time. It is a very simple idea that works on the pull method of inventory management. This means a product or unit is ordered just in time for when it is needed. Kanban is a concept related to lean and just-in-time (JIT) production. Kanban is a signalling system to trigger action. As its name suggests, kanban historically uses cards to signal the need for an item. 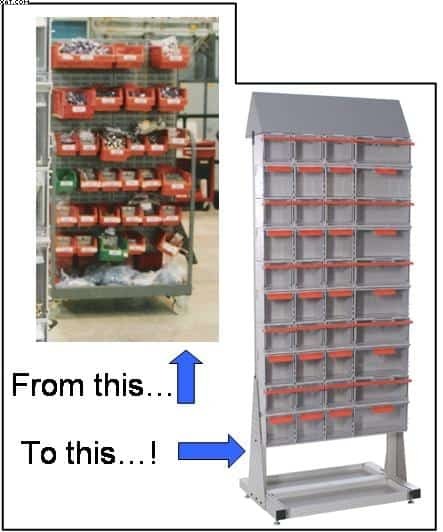 Hurst Green Plastics Ltd have embraced this theory to offer a true Kanban system for your storage and dispensing. When the bins are empty, the user simply pulls the slider to drop down a reserve stock. The upper bin can be clearly identified for replenishment and re-ordered. Importantly, there are no stock-outs and manufacturing can continue. With the new FlagBin™ dispenser, the identification of stock levels is very clear. You can see exactly what level the bins are at without having to check. The RFID TwinBin can automatically provide the re-order status and ML Systems’ powerful software can interpret and action each individual bin without the user physically checking the bins. Lean manufacturing is all about making your manufacturing more efficent. This is done by looking for what adds value and removing waste. Value is any action or process that a customer would be willing to pay for. Any processes that add Value need to be kept and if possible improved further. Waste refers to any action or process that does not add value. For example a long walk to the stores for a part would be seen as waste and the time used to walk to stores could have been used more effectively elsewhere.